Last night I won $84 on my 6/49 loto ticket. So I purchased another one. I know that statistics prove that lucky streaks are random occurrences, but maybe I’m having randomly occurring luck. It certainly seems to be that way with the birds recently. 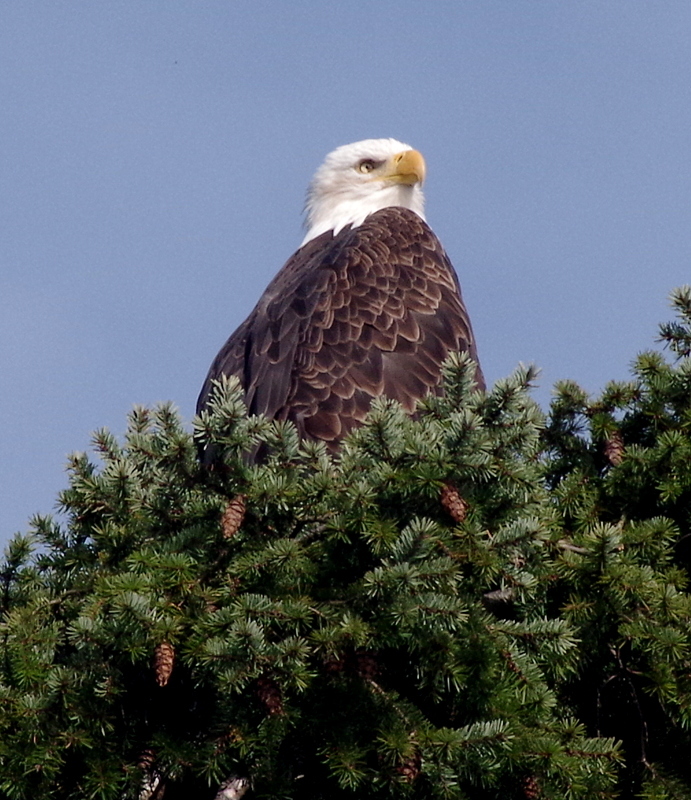 I’ve seen three bald eagles in the past five days, another one just today around noon. It seems to have taken up residence in a local tall tree. Another bird that is quite literally trying to take up residence is a Pileated Woodpecker. I heard its tapping and then saw it low down on a rotten tree trunk, right beside the trail, excavating a huge hole. I had the camera set up at f32/400th of a second, which was a mistake, because the auto ISO function set the ISO so high the image was very noisy. I’m trying to improve my image sharpness, but this was over doing things. I also took some video of the woodpecker, but it wasn’t in focus. Crossing the floating bridge I was treated to a show of herons and ducks. 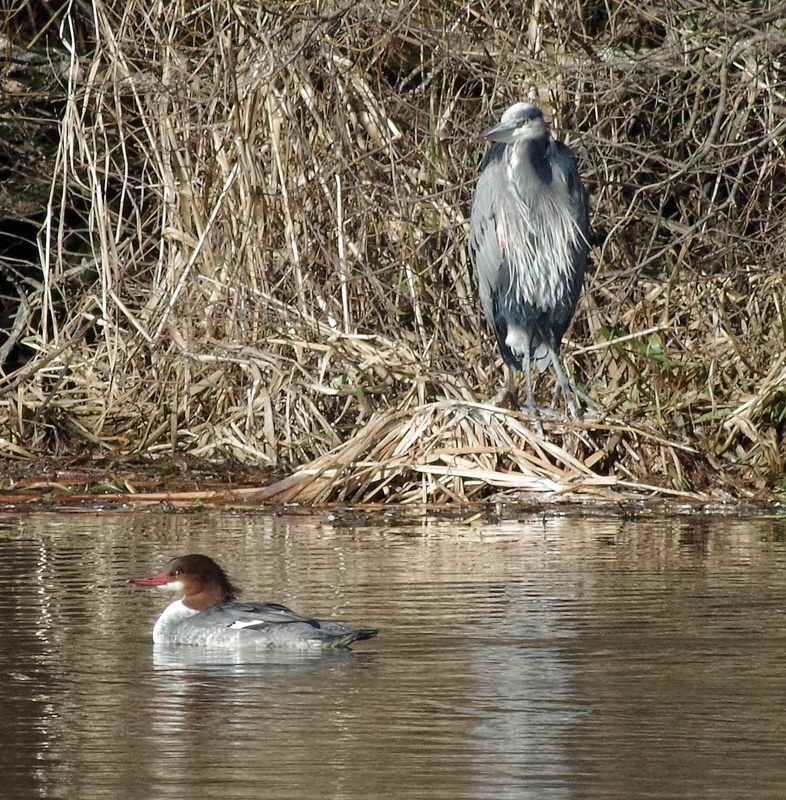 One heron was preening itself as several Mergansers cruised by. One Merganser then flew right in front of me but the photo was out of focus, sadly. 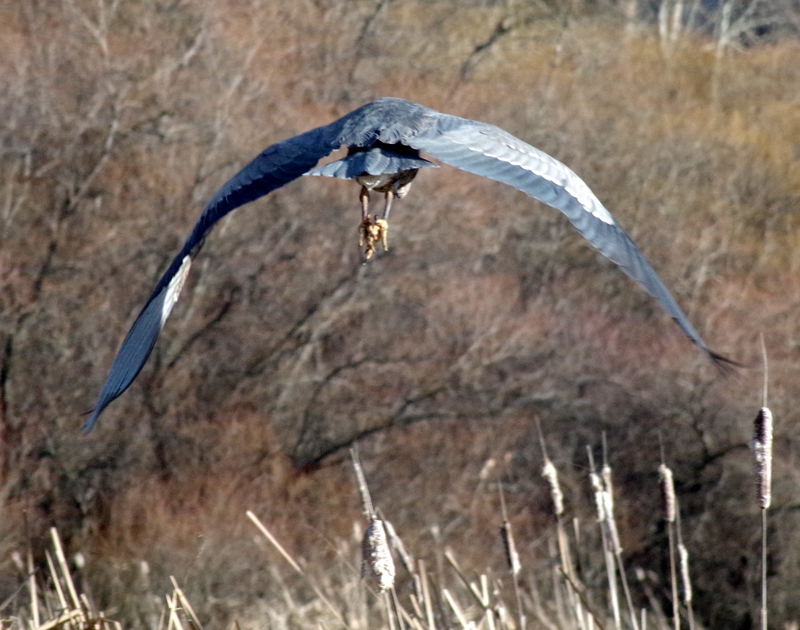 However, I did catch another heron as it swooped by. 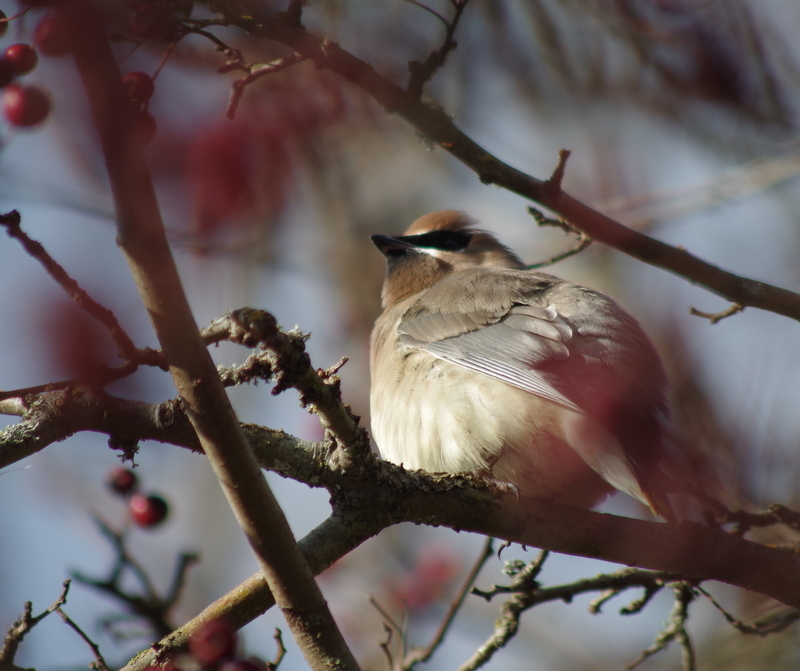 Yesterday, close to home I spotted a Cedar Waxwing. Now to spread the good fortune around I will be promoting my novel The Game of Hearts, by giving away the Kindle ebook free for the next five days, starting tomorrow, January 7th. Just go to the Kindle website listed at the top of this page and you will find it there. I returned to the tree 2 hours after I first saw the Pileated Woodpecker to try my luck again. This time I set the camera on a tripod and waited. Sure enough after a few minutes the woodpecker returned with a series of squawks, and began digging out the tree. It was on the opposite side of the first hole however, and the sun was right behind it. I had to move the camera into the shadow of another tree, which obstructed my view somewhat, but the results were much improved. While I was waiting for the woodpecker a wren arrived to check out the excavation. 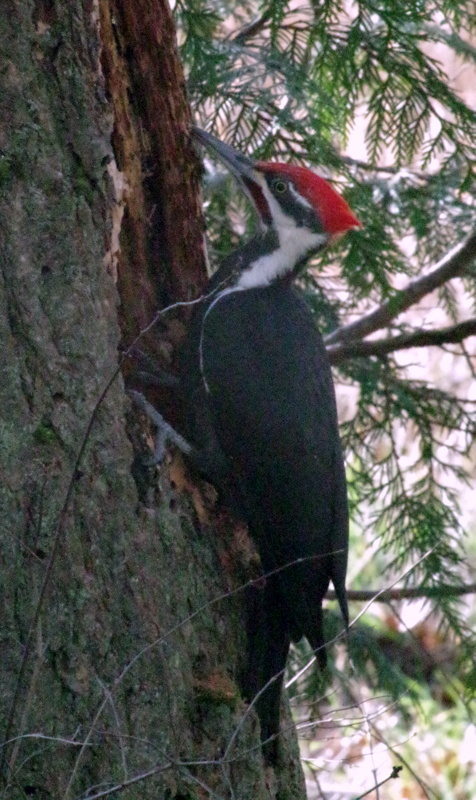 Pileated woodpeckers are just amazing – I saw one once, working on a dead tree.